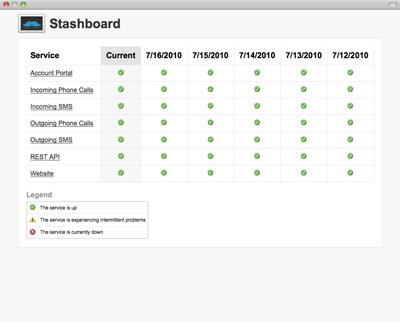 Stashboard from Twilio let’s you build a simple green-yellow-red status board for all APIs and services in your stack. Originally built for Twilio’s own status page, Stashboard is built in Django and deploys easily to Google’s App Engine. Stashboard has a REST API that lets you manage services, events, and statuses. A service is an item such as a web service that you want to track in the Stashboard. Services have a list of chronological events that track status changes for the service. The current status is the status for the latest event for a service.